Superior Stanton Fruit Land Forever Protected! It’s a brilliant September day as I climb into Terry Stanton’s Jeep, vibrating outside the office. We are headed out to see the farmland that Terry and his family have recently protected through a purchase of development rights. Plastered on the side of the Jeep is a giant cherry graphic accompanied by the words “Cherry Russo.” I later learn that it is the name of a cherry concentrate that Terry is marketing. 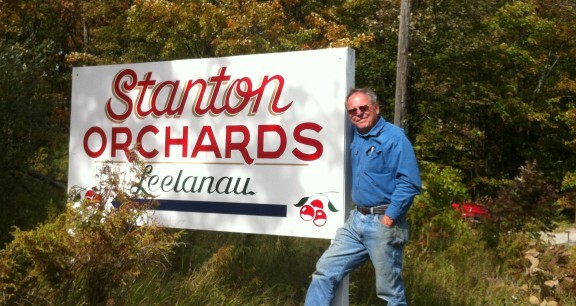 A retired ad executive turned farmer, Terry has been involved with cherry marketing efforts in the region for years—as was his father, Earl, before him. As we turn on to Overby Road, any doubts I had about the Jeep’s road worthiness are dispelled. 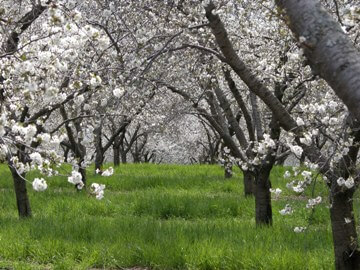 The diesel engine roars as we climb the hill into Stanton Orchards. Passing row upon row of trees, Terry hangs a right and keeps climbing until the Jeep comes to rest on what feels like the top of the world. When the leaves fall, Terry says he can look down on Sugarloaf and stunning views of Lake Michigan. The best fruit sites also make some of the best home sites, notes Terry. Earl bought the land in 1960. He had just retired from a successful marketing career at Libby Fruit Co. in Chicago. He had watched the shelf space for canned fruit dwindle and knew long before other farmers did that the cherry dessert market was in decline. That knowledge informed many of his decisions. Before planting, Earl brought in bulldozers to level the land. When a nearby sawmill was about to close because it had no place to dispose of its sawdust, Earl had 10 truckloads a day hauled up Overby Road. He spread the sawdust, mixing it with nitrogen, to enrich the soil. 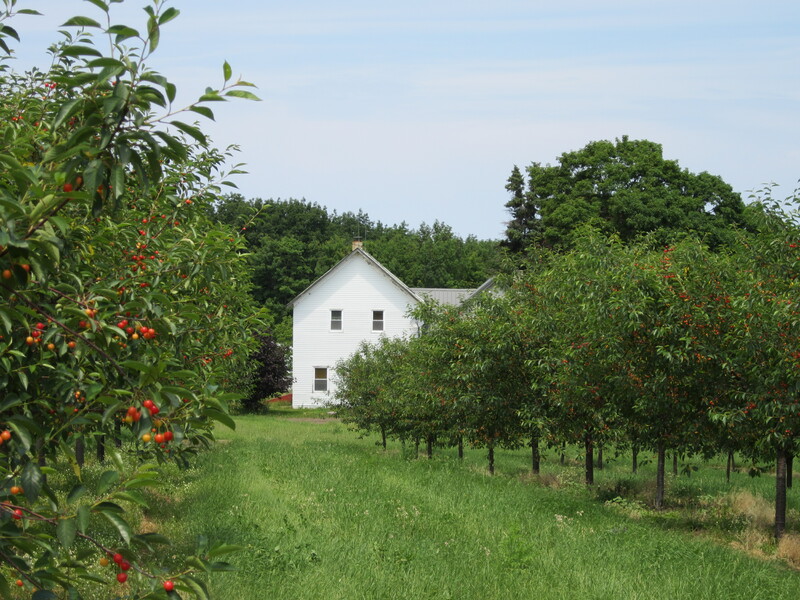 Fifty-some years later, Terry, who inherited the farm in 1979, is making certain that the site will always be available for growing fruit. This fall he and his family put 172.5 acres into a conservation easement. Terry’s son, Greg, now runs the farm, and 10 grandchildren enjoy helping out. Terry is convinced that the health benefits of cherries will propel the industry forward and is optimistic about the future of farming.